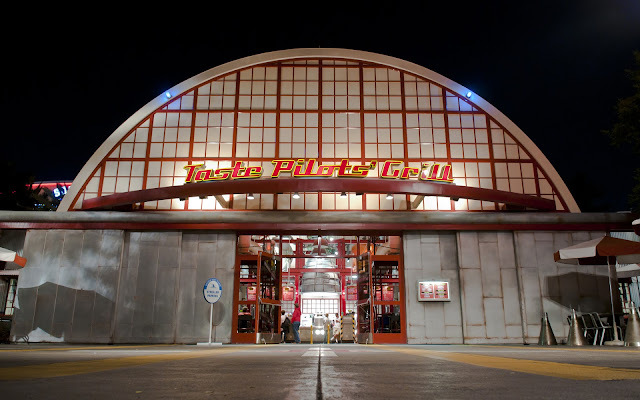 Once upon a time, Taste Pilot's Grill had a big jet sticking out of its facade. It represented the aviation theme of Condor Flats in overt fashion, and it created a recognizable feature for the restaurant. Unfortunately, when Buena Vista Street debuted, the powers that governed the park aesthetics felt that the jet might be too visually intrusive into Carthay Circle, and to streamline viewlines, the jet was removed. Incidentally, what's taken its place doesn't really look too shabby. It might have been a stark absence to long time park goers, but for someone who might have never visited before, there's no evidence this facade used to be any different. And really, in a way, the simplicity makes for a cleaner, nicer looking restaurant front. Sure, it lacks the pizzazz it used to have, but there's still beauty to be found here. The new Taste Pilot's Grill facade.